Here are a few reasons why many of the top 500 corporations in the world choose the Roadware Microdoweling™ Concrete Repair System and Roadware 10 Minute Concrete Mender™ to keep their floors in top condition. Smooth floors are safe floors. Cracked and uneven floors are a leading cause in workplace accidents. Trips, falls, and tipped loads can lead to life changing accidents that can cause a really bad day for your entire organization. Keeping floors in good repair with Roadware 10 Minute Concrete Mender will help maintain a safe workplace. A workspace that looks good, will work good. Your floors support your entire operation. Clear and smooth floors free from cracks and spalls are more productive and bring confidence to your entire team. Roadware 10 Minute Concrete Mender™ can permanently repair cracks, spalls and joints. No more disappointing repairs that last only a few weeks. Retail operators like Wal•Mart, Home Depot, and Target spend millions of dollars to make their floors look good. They know that good looking floors and good looking stores lead to greater revenue. The same is true for warehouse floors and production floors. Your team will feel better, will be more productive, and will work better. 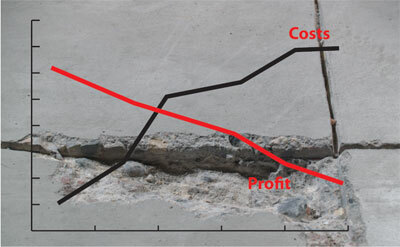 Floors with cracks and spalls steal money from the bottom line. Just think about all the costs related to floor issues. Workers Comp claims attributed to accidents. Workers Comp claims due to repetitive stress injury of fork truck drivers. Fork truck maintenance and repair. Contaminated product from loose debris in floor cracks. Damage floors will get worse if not addressed quickly. Smooth floors are productive floors. Floors with cracks and spalls can slow down your operation. 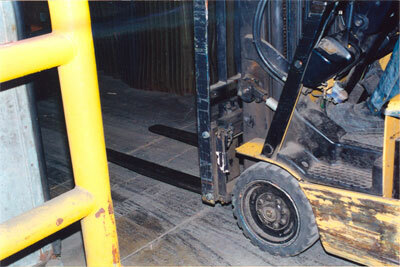 When a fork truck has to slow down for a spalled control joint, productivity suffers. When a team member needs to summon help to push a cart through a threshold, productivity suffers. 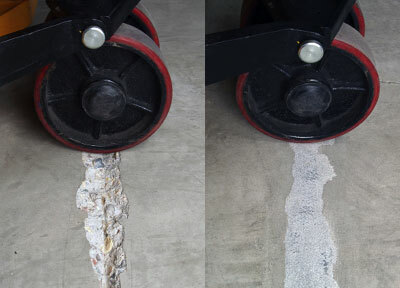 Using Roadware 10 Minute Concrete Mender™ to repair floor bottlenecks that slow everything down will help productivity.